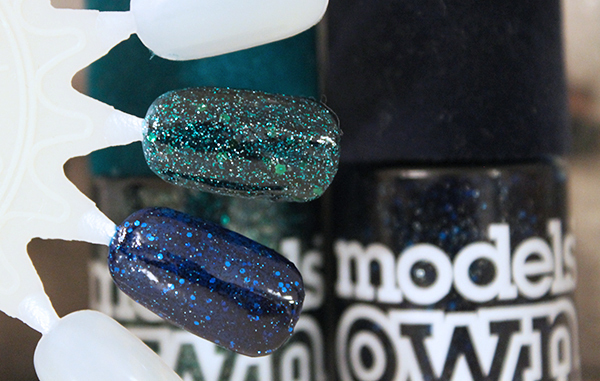 You all know my love for some dark glitter nail polishes so imagine how excited I was when Models Own came out with their own take on the trend with their Models Own Velvet Goth Collection. I’ll admit, I’m a little late to try them but I’ve finally got my hands on them at last. I picked up 2 shades from the collection to try with my boots advantage card points (free nail polish woo!) including the shades Absinthe (dark green) and Valerian (navy blue). Here’s what I think of them. 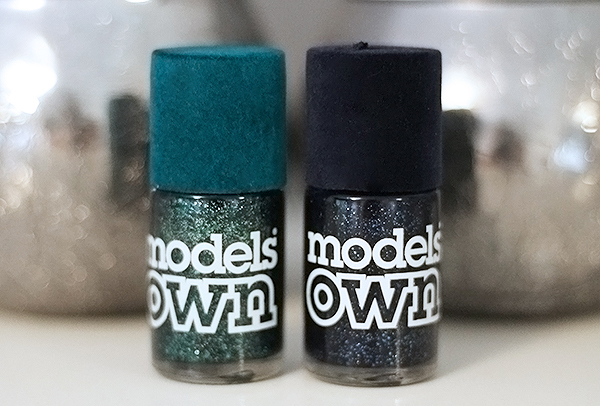 The polishes come in the typical Models Own packaging with the added velvet lid to identify the collection. I’m not too sure velvet is the right way to describe it but it definitely has a dark gothic feel to it. There’s currently 5 shades in the collection but I decided to pick up two shades I don’t really own and shades which go with a lot of my clothing choices. Plus they’d be perfect for halloween! The formula consists of very fine glitter with a couple of larger glitter speckles thrown in to add a bit more texture. Usually glitter nail polishes can be quite obnoxious but with the glitter so fine it’s completely wearable on every nail without looking too crazy. On the first application I found it pretty easy to apply as long as I had an even amount of product on the brush. However, the real difficulty comes when it’s time to apply a second coat. Compared to my other glitter polishes of the same sort of formula, I find Velvet Goth to be much thicker and quite hard to get an even layer over the first layer. I’m considering picking up a nail polish thinner to see if it makes any difference but as long as you’re patient when applying you’ll manage to get it right eventually. Once it’s applied I prefer to use a clear top coat just to pull everything together and add a little bit of shine to the gritty texture. I love the look of these polishes and I’m really tempted to pick up a few more of the shades from the collection. As for the wear time, this polish isn’t going anywhere. I’ve managed to have chip free nails for 7 days just from 2 coats and 1 clear top coat so if you’re looking for a long lasting polish, look no further!